Saturday, September 8, 2018 from 10 a.m. to 4 p.m.
Come and step through the doors of some of our city’s most unique structures and heritage sites. Learn about our history, culture and community initiatives while appreciating some of Thunder Bay's remarkable architecture – all FREE of charge! Follow our event on social media through Facebook and Instagram. Located on the north shore of Lake Superior under the protective watch of the Sleeping Giant, Thunder Bay is a vibrant urban community in a wilderness setting. The largest Canadian city on Lake Superior, Thunder Bay is located on the traditional territory of Fort William First Nation, signatory to the Robinson-Superior Treaty of 1850. Thunder Bay enjoys a rich and unique blend of heritage that includes Indigenous peoples, the fur trade, shipping, industrial history, immigrant history and cultural and natural heritage. 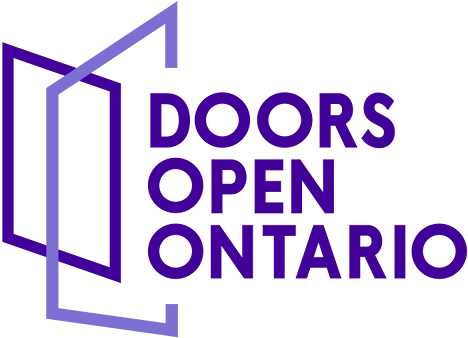 Help us make Doors Open Thunder Bay a great experience for all to enjoy. Be a Greeter, a Visitor Counter or assist as a Guide. For more information or to sign up as a volunteer, call Laurie at 807-625-3197. This former Canadian Coast Guard ship was built by the Port Arthur Shipbuilding Co. Ltd. between 1957 and 1958. The Henry, a light icebreaker, served on the Great Lakes from 1959 to 1984 – tending buoys, supplying lighthouses, etc. The Henry returned home to Thunder Bay on June 27, 2017 under the care of the Lakehead Transportation Museum Society. The Blue Sky Community Healing Centre is an established northern Ontario social enterprise. Blue Sky provides professional development entitled One Tribe Indigenous Worldview and Diversity Coaching (income mechanism), and inspires self-discovery and self-healing within individuals. During Doors Open, Blue Sky will share demonstrations of drumming, Indigenous sacred items, and traditional Indigenous lodges. Note: There are cats onsite. Formerly the Fort William Public Library, this impressive brick-and-limestone library was constructed through a grant from the Carnegie Foundation. The library opened in 1912 under the direction of Fort William's first permanent female librarian, Mary J.L. Black. A true pioneer of strong professional women in northwestern Ontario, Black also became the first female president of the Ontario Library Association. Saturday: 10 a.m. to 4 p.m.; guided tour at 2 p.m. This contemporary facility, built in 2016, addresses the evolving needs of technology and education within carpentry-related trades. The building’s design, inspired by features found in northwestern Ontario, also incorporates the materials and methods traditionally used by carpenters. The 8-metre-high (26-foot-high) practical training area features an engineering training structure used for high-angle rescue, working at heights and suspend-access training. Built by the Fort William Parks Board in honour of Canada’s centennial, construction of this 18-tonne structure began in 1965. In November 1967, this oasis opened as one of only 10 conservatories in the country. The 1,096-square-metre (11,800-square-foot) viewing area features cascading waterfalls, pools and winding pathways among an extensive display of exotic flowers, plants and fruit-bearing trees. Architect: Lord & Burnham Company Ltd.
Sheba Films will be screening their award-winning documentary Long Walk Home: The Incredible Journey of Sheila Burnford at Paramount Theatre during Doors Open. This 30-minute film about the local author of the classic novel-turned-Disney film The Incredible Journey will run at 11 a.m., 1 and 3 p.m. A collection of Burnford memorabilia will also be displayed in the lobby. Saturday: 11 a.m. to 3:30 p.m.
Start your Doors Open day with a walking tour hosted by the Fort William Business District Business Improvement Area. Meet at the Up Shot Coffeehouse, where the tour will start at 9:30 a.m. sharp. The tour will include visits to the Chapple Building, the Blue Sky Community Healing Centre, St. Andrew’s Presbyterian Church and the Brodie Resource Library. One tour only on Saturday from 9:30 to 11 a.m. Built as a Centennial Project, this park was organized by the Soroptimist Club of Fort William and Port Arthur, later called Soroptimist International of Thunder Bay. The official sod-turning for the garden took place on November 16, 1966. Over the following years, dedications for 18 different gardens with memorials have taken place – representing various ethnic organizations within the city. Located in the former McKellar Hospital, this clinic provides an innovative team approach to health care in a cost-effective manner. Six nurse practitioners work collaboratively with registered nurses, registered practical nurses, a social worker, pharmacist, dietitian and psychiatrists. Since opening in 2010, the clinic has played an important role in the advancement and recognition of nurse practitioners in the community. Construction of Port Arthur’s deluxe movie theatre, designed by architect Jay Isadore English, began in 1947; it opened in December 1948. The theatre co-hosted the 1963 world premiere of Walt Disney’s The Incredible Journey, an adaptation of Port Arthur resident Sheila Burnford’s classic novel of the same name. The theatre’s original balcony layout, seating and projector remain in place today. Opened in 1911 by the Canadian Northern Railway, this six-storey stately brick and stone structure with its fine finishings and modern facilities was considered the finest hotel between Toronto and Winnipeg. The Royal Canadian Legion’s poppy campaign was ratified here at a meeting in 1921. This historical event is commemorated by a plaque found in the two-storey rotunda. The RFDA distributes food throughout the region, from its home at 570 Syndicate Avenue South. Currently called The Paterson Family Food Centre, the structure – built in 1962 as the A&P Food Stores – later became the Diamond Bingo Hall. In 2011, the building was extensively renovated and repurposed into a food distribution facility – with a kitchen, warehouse and office space. Designed by architects Stinson and Hood, this magnificent church is constructed almost entirely of white sandstone from Simpson Island. Completed in 1909, its late-Gothic revival style is revealed through its pointed arches and windows, carved Corinthian capitals, crenellated parapets, square towers and corner buttresses. Splendid memorial stained-glass windows adorn both levels of the sanctuary. Osada Sv. Petra (St. Peter’s Parish) was formed in 1906 to serve the Slovak Catholic community. The church, near completion, was lost to fire in 1907. The rebuilt Romanesque-style church seen today was completed in 1911. Stations of the Cross in Slovak, ordered from France in 1908, grace the church’s interior, along with ceiling murals by artist L. Scott Young. The Thunder Bay Masjid – the only masjid in northwestern Ontario – has served the local Muslim community since 2002 when this place of worship was purchased and transformed into a masjid. During Doors Open, guided tours will be offered so that visitors can see the space where prayers, services, community engagement and educational programs occur. Constructed in 1906, this building operated as a firehall for 79 years, and was the area's last horse stable station to be retired. Purchased in 1987 by the Thunder Bay Multicultural Association, the Court Street façade was renovated to recall its original design. The Cooke Street façade was restored with its original brickwork and the hose tower remains intact. Completed in 1918, this is the first Ukrainian Catholic Church established in the province of Ontario. Built in the traditional Byzantine style, the cross-shaped plan features two square towers along with a central octagonal superstructure topped with onion domes. Inside, the art of Teodor Baran – celebrated for his Byzantine church painting, ornamentation and iconography – adorns the sanctuary walls and ceilings.